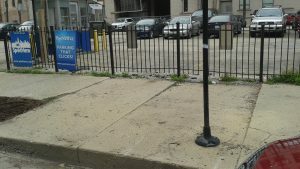 In Illinois, city governments have a duty to maintain their sidewalks in a reasonably safe condition for the pedestrians who use them. Individuals who are injured in slip and falls (or trip and falls) on a poorly maintained city sidewalk can bring a lawsuit against the city for their injuries. However, slip and fall claims can be very challenging due to special immunities that exempt the city from liability under certain circumstances. It is always important to consult a personal injury attorney about your potential claim. First and foremost, if you are injured on a city sidewalk, you must act quickly. The Statute of Limitations, or time period for filing a lawsuit, is shortened when the defendant is a governmental entity. Typically, in Illinois, your personal injury claim must be filed within one year from the date of the injury, or it will be barred, meaning that the law will prevent you from filing your claim. This does not mean, however, that you have one year to find an attorney. There is a great deal of investigation and preparation that should be done before filing a lawsuit, much of which takes time. You want to allow your attorney enough time for them to provide you with the best legal representation possible. The sooner you contact an attorney, the better.